Now View the Upstate Mobile Website! 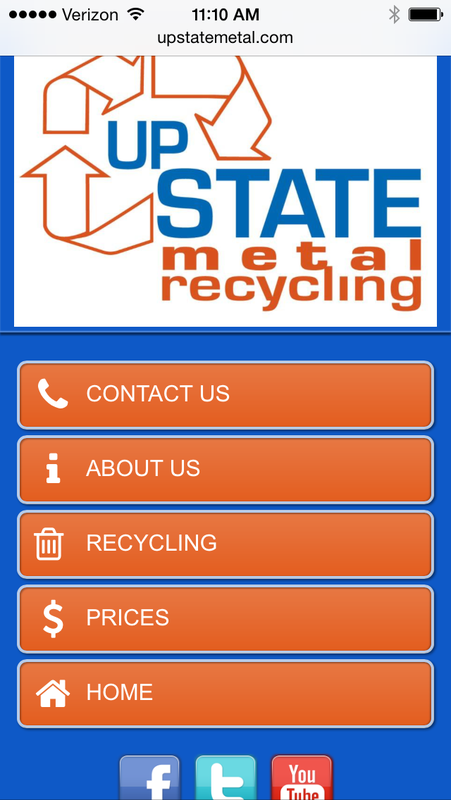 We’re excited to announce that Upstate Metal Recycling has a brand new mobile website! Now accessing Upstate on your mobile phone is easier than ever! To view our mobile website just type our web address: http://www.upstatemetal.com into your smartphone! Springtime is the perfect time to not only start your annual spring cleaning, but it’s also a great time to start collecting all your unwanted scrap metal. If you’re new to the area, or have never collected scrap metal before there are several ways to find the most current scrap metal prices. One way is by looking through your search engine for scrap metal processors. Most websites either provide you with a telephone number or a handy webpage that provides you with up to date scrap prices. Try to come in contact with a handful of scrap metal processors so that you can compare and contrast their prices. Truth be told, they should all be fairly similar. I’m sure there’s been a grocery shopping trip that has caused you to bring home what seems like several hundred plastic bags. When you’re forced to deal with these bags, what do you do? Plastic bags? I always use my own bags! Something tells me that a great portion of you would answer-Pitch them. This is getting to be a problem due to the extreme plastic bag waste found in landfills. A plastic bag takes 500 years to decompose in a landfill…imagine how man years it would take to decompose them all? The city of Los Angeles has officially put an end to the use of plastic bags. As of January 1, 2014 those shopping at a grocery store must bring their own reusable bags or pay ten cents for each paper bag they use. Plastic bags are no longer even an option. The dailynews.com recently posted an article regarding this new bag ban. Read, Los Angeles Bag Ban Starts January 1. Do you think this could ever be possible in your city? Do you already use reusable bags instead of plastic? Have you ever heard of the term, Miscellaneous Energy Load (MELs)? This term basically sums up the energy used to power our non-stop running electronics. Think about it…take a look around your house and determine what electronics you have plugged in all day every day? I’m sure there are several others on the list that I haven’t even considered. Unfortunately, in America we use more unnecessary energy than any other nation. This problem is getting progressively worse. Within the past two years the Environmental Performance Index (EPI) ranked our country 49 out of 132. Can the U.S. possibly catch up with other energy savvy nations? The Huffington Post recently posted an article listing five tactics we as a nation can use to help cut back on energy use as well as how we can create renewable energy. Follow the link to read the article, Renewable Resources: We Sorely Need To Develop a Culture that Embraces Them. In the mean time, what can you do at home to help cut back on your energy use? Could you unplug that lamp that rarely gets used? Or that television you only watch in the evening? With the holiday season coming to a close, don’t forget to recycle your Christmas tree! Granted, we at Upstate Metal Recycling can’t take your old Christmas tree…but we can help point you in the right direction to those that do! 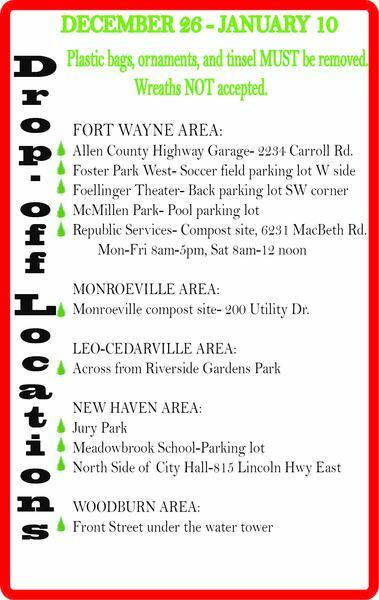 Check out a list of parks around Fort Wayne collecting trees!